FAWMA is fortunate to have enthusiastic volunteers across the country that are responsible for the Association’s marketing and public relation platform. The P&E Committee volunteers undertake a variety of activities to educate people on the mission and benefits of the Army Women Museum. Facilitate and attend educational outreach programs, conferences, meetings, K-12 programs and other activities. In addition to identifying possible activities to attend, our volunteers are frequently sought out by many organizations. Publish a quarterly report to all FAWMA donors and others through email and print. Educate and advocate for the Army Women’s Museum in multiple locations throughout the United States. FAWMA committee members are very knowledgeable on the mission of the U.S. Army Women’s Museum and are able to facilitate the P&E outreach program, and any other publicity and educational outreach opportunities. Many of our volunteers are military veterans. Check out Outreach page to see where they have been and what’s going on! Cydnee Gentry: Chairman/Northern Virginia, Washington DC, and Maryland – Cydnee is an educator, USMC spouse, and Military Brat. 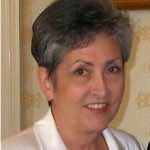 Over the last 30 years, she has worked for the Department of Defense, Military Family Readiness Programs, VAM, FAWMA, Scouts, various museums, public schools, and nonprofit organizations. 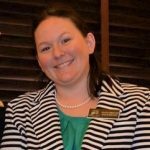 She is a certified teacher in the state of Virginia and holds a BA from the University of North Carolina in Education and an MEd in Curriculum and Instructional Technology. Cydnee enjoys computers, history, travel, and working with children. She lives with her husband, Robin (Colonel, USMC (Ret) and family in Northern Virginia. 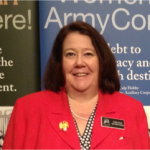 Candy Martin: Quarterly Report/Fort Sam Houston, Texas – Candy is a retired Chief Warrant Officer Five. with a specialty in Property Accounting. Candy holds a BS Degree in Elementary Education and MS in Organization Leadership from the University of Oklahoma. 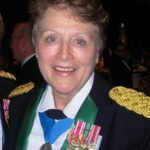 She is the Past National President for American Gold Star Mothers, Inc, Army Reserve Ambassador, USO volunteer, and has many years of volunteer experience working with nonprofit organizations. She is married to retired Sergeant Major Ed Martin, and they both live in San Antonio, Texas. 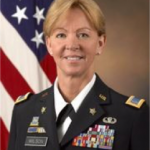 Phyllis Wilson: Geo Rep/Fort Rucker, Alabama – Phyllis is a retired Chief Warrant Officer Five, and became the 5th Command Chief Warrant Officer (CCWO) for the United States Army Reserve in 2012. 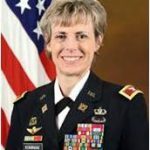 As the CCWO, she represents an advises the Chief of the Army Reserve/Commanding General, U.S. Army Reserve Command on matters pertaining to training and education, career management, leader development and warrior transition issues for warrant officers with the Army Reserve. She is also responsible for coordinating policy and statutory changes to support the advancement initiatives for the Warrant Officer Corps. She is married to Brian; a retired Special Forces warrant officer. They have five children: Joseph, Jeremy, Rebekah, Matthias, Rachel, Jared, Maria and Jesse. Three sons: Joseph, Jeremy and Matthias a serving on Active duty and are all combat veterans. Denise Scarboro: Geo Rep/Joint Base Lewis-McCord, Washington – Denise Scarboro is a retired US Army Chief Warrant Officer 5 with over 37 years of service. She began in the Army as a Military Policeman and then a Criminal Investigator and later a Polygraph Examiner. When she was transferred to (then) Ft Lewis, WA, she decided to leave the active Army and spent the next 18 years as a Reserve US Army Soldier. During that time, she also worked as a City of Puyallup Washington Police Officer. The attacks on September 11 caused her to reactive into full time service with the US Army. After retiring, she returned to the Puyallup area where she has since obtained her Master’s Degree in Christian Leadership and works as a Pastor’s aide in her church. She volunteers at the USO and as a Geo Rep/Camp Lewis for the Friends of the Army Women’s Museum Association. Amanda Strickland: Geo Rep/Anniston, Alabama – Amanda grew up a Military Brat with her mother, a retired Navy Chief. In 2009, she completed her undergrad at Sweet Briar College in Archaeology and History and began working in the Army Museum System. In 2014, she completed her Master’s degree in history. 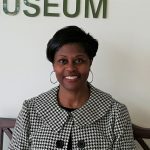 She has worked for Army museums at Fort Monroe and Fort Lee, VA, and is currently a GS employee working as a Museum Curator at the Army Museum Support Center in Anniston, AL. Gail Taylor-Black: Geo Rep/Fort Lee and Blackstone, Virginia – Gail is a retired Army Sergeant First Class and is married to a retired Army NCO. Upon separating from active duty in May 2000, Gail served in the Virginia Army National Guard for 14 years and was highly decorated during her career. Gail worked in the Nottoway County High School as a substitute teacher. Her current position is as a Citizen Soldier for Life Counselor with the Virginia Army National Guard. She is a member of the VA Purple Diamonds and is active in several veteran’s groups and is involved in church and community activities. Gail is a loving mother and grandmother and resides with her husband, Clifton and their black lab, Shadow in Blackstone, Virginia. 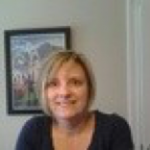 Aimee Kominiak: Geo Rep/Northern Virginia – Aimee graduated from the United States Military Academy, West Point, in 1987 and was commissioned as a Second Lieutenant in the Quartermaster Corps. She also holds a Master’s Degree in Materiel Logistics Management from the Naval Postgraduate School, and a Master’s Degree in National Resource Strategy from the Industrial College of the Armed Forces. Her military education includes the Quartermaster Officer Basic Course, the Combined Logistics Officer Advanced Course, the U.S. Army Command and General Staff College, and the Industrial College of the Armed Forces. In July 2011, she took command of the 23rd Quartermaster Brigade, Fort Lee, Virginia. Most recently, she served as the Military Assistant to the Principal Deputy Under Secretary of Defense, Acquisition, Technology and Logistics, Office of the Secretary of Defense and retired in 2017. Aimee is married to Colonel Larry Kominiak and lives in Northern Virginia.